Best part: The confronting gore. Worst part: The two-dimensional villains. Groundbreaking drama-thriller Blue Ruin’s production process is worth its weight in Cannes Film Festival statuettes. 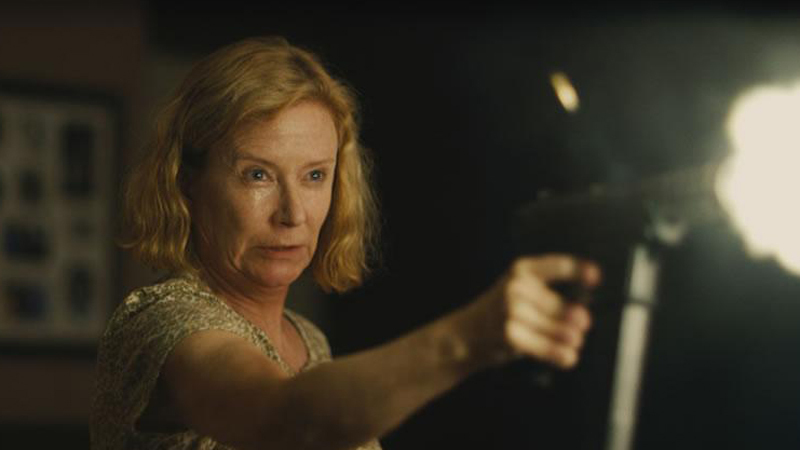 Kick-started by writer/director Jeremy Saulnier, the project, after being rejected by the Sundance committee, hit the festival circuit to major acclaim last year. Like its lead character, the movie has vigorously stormed back into the spotlight. This crime-thriller, sporting several surprises and a point to prove, is a revelatory gem unafraid of its big-budget competition. Confucius says: “Before you embark on a journey of revenge, dig two graves”. Blue Ruin sticks with this idea the way its lead character clutches his rifle. Aware of the sprawling revenge-thriller craze sweeping the globe’s film movements, Blue Ruin takes a back seat to examine the past decade’s best and worst examples. From the sublime (Drive) to the stupefying (Faster), the vengeful anti-hero flick is a popular one. Attacking the post-GFC world we trudge through, these movies look down upon the bigwigs and support the passive-aggressive little person in us all. Following this trend in a highly effective fashion, Blue Ruin’s characters are about as normal and empathetic as possible. From the get-go, we follow a homeless cretin on the verge of oblivion. Dwight (Macon Blair), sporting a bright, orange beard and frizzy hair, is a resourceful and guided man. Brought into a police station, Dwight is shocked to learn of the release, from a lengthy jail sentence, of his parents’ murderer. From there, Dwight looks for a weapon, map, and petrol to track down and destroy him. Along this dark and painful road, Dwight must protect his sister Sam (Amy Hargreaves) and her children. In addition, whilst looking for the target and his redneck family, he must consult his life-long friend Ben (Devin Ratray). Knocking the audience around throughout its brisk 90-minute run-time, Blue Ruin’s gripping twists and turns will keep even the most impatient viewer engaged. Refreshingly, the revenge-thriller aspects of this revisionist character study inflict only the first 30 minutes. The first half-hour, delving into one man’s obsessive behaviour and depressing situation, becomes a tempered and methodical action-drama. Using a minimal amount of dialogue, this section subtly re-defines genre conventions and festival-worthy cinema. From there, after his motivations are made infinitely clear, the narrative rollickingly sprints toward its violent and thought-provoking denouement. Throughout the second-two thirds, the eye-for-an-eye narrative delivers vile antagonists and nail-biting stand-offs. Naturally, some may react negatively to the “Well…now what?” transitions. In fact, these ascending and descending turns are more divisive than conclusive. However, the plot becomes more tenacious and intelligent once the central conflict is established. Commenting on this ever-present revenge-thriller trend, certain characters, plot mechanics, and action sequences subvert expectations. After Ben is introduced, Dwight’s naïve nature lends several comedic jaunts to this intensifying story. Thanks to this strong satirical edge, Dwight’s reactions and judgments allow the tight narrative to take deep breaths when required. Moulding the Coen’s darkly comedic mean-streak to Nicholas Winding-Refn’s meticulous direction, Saulnier’s style develops this world in a productive and enthusiastic manner. “You know what’s awful? 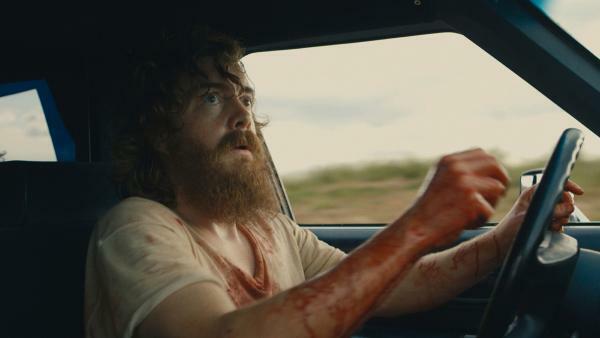 Just ’cause my dad loved your mum…we all end up dead.” (Dwight (Macon Blair), Blue Ruin). One of many ultra-violent moments. His heart-breaking tale, keeping details locked away for extended periods, is refreshing compared to its competition. Intrinsically, his visual motifs and taste for violence develop this devastating universe. The gore – comprised of exploding heads, bullet wounds, and devastating cuts – delivers several flinch-inducing moments and profound sequences. Once scene, in which Dwight tries and fails to pull an arrowhead out of his leg, highlights Saulnier’s deft directorial touch. Presenting a desecrated and angry Middle America, Blue Ruin keeps strange objects hidden in private places. Presenting a paranoid and paranoia-inducing state of mind, this sickly dark thriller points the finger at gun worship and Right-wing ideals. Handling its ripe agenda, Saulnier’s creations walk the line between chaos and control. Dwight’s journey, despite littered with realistic elements, is never sympathetic. Sporting a significant backstory, his dour livelihood is fascinating to endure. Breaking into other people’s homes, his tragic existence anchors this bloodcurdling and debilitating experience. Blair delivers a touching and lively performance as our sorrowful lead character. As the bumbling revenge-getter, his character relieves us of the modern anti-hero. Lacking a “particular set of skills”, Dwight’s shaky persona shapes each invigorating set piece and eclectic dialogue-driven moment. Following up his pleasurable turn in Nebraska, Ratray’s deadpan performance grounds this polarising and discomforting thriller. Before the ambiguous and blood-curdling finale, Blue Ruin establishes itself as an ambitious and realistic revenge-thriller. Taking on multiple genres and viewpoints, the movie looks at our infatuation with violence on the big screen. Thanks to Saulnier’s effortless direction and taut screenplay, this breakout effort displays a filmmaker’s style devoid of obvious ticks. 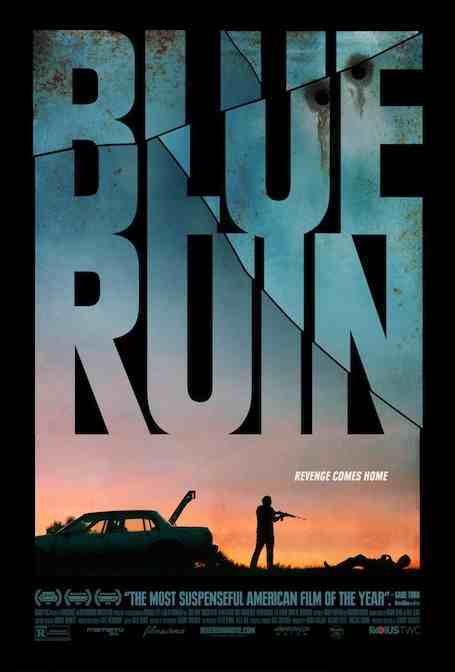 Headed for critical acclaim, Blue Ruin’s journey leads to a purposeful and memorable destination. Verdict: An intensifying and refreshing thriller.